HAMILTON, ANDREW, deputy governor for the HBC in James Bay; fl. 1688–89. Under the treaty of neutrality concluded in November 1686, before the news of de Troye’s activities in James Bay had reached London, the French retained the Company’s forts even though they had been captured during a time of peace. In 1688 Hamilton was associated with governor John Marsh, William Bond, and John Simpson in an attempt to re-establish trade for the Company in Albany River (called by the French the Quichicouane). From the time they arrived in September they were harassed by the French. Bond, who took precedence of Hamilton in council because of his experience in the country, was captured in December 1688 and when Marsh died in January following, the command fell to Hamilton. 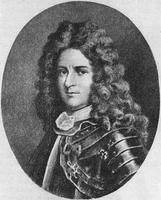 By March Hamilton had surrendered to Pierre Le Moyne* d’Iberville. The French sent him with about 30 other prisoners to sail for New England in the captured Huband, but once at sea the company “resolved for England.” Contrary winds and shortage of food forced them into Limerick, where Hamilton sold the Company’s ship and shared the proceeds with his companions. Nothing more is known of him. Alice M. Johnson, “HAMILTON, ANDREW,” in Dictionary of Canadian Biography, vol. 1, University of Toronto/Université Laval, 2003–, accessed April 24, 2019, http://www.biographi.ca/en/bio/hamilton_andrew_1E.html.